Robin Hood as you have never met him before…. Was Robin Hood real? Or a fantasy? J.P. Reedman’s Robin is definitely fantasy. More than that, he is fantasy that becomes entangled with horror. 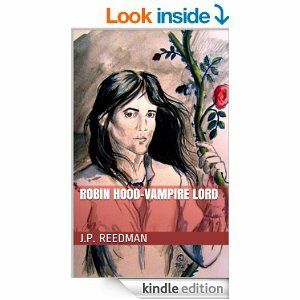 The title, ROBIN HOOD – VAMPIRE LORD prepares you for what follows, when the Robin we all know and love falls victim to the vampire Abbess of Kirklees, who wants him as her mate into eternity. Except that she neglects to ask him if this is what he wants too, and simply goes ahead to prey upon him anyway. Only too successfully. Before he knows it, Robin is one of the undead. And he hates himself, even as he struggles against his vile new need for blood. For him, the death of others is now the only way to preserve his own life, but the very idea revolts him. Can he fight against the dreadful fate bestowed upon him by the False Abbess? From somewhere he finds the strength to defy her, and his punishment is to be incarcerated in a stone coffin, so that soon, to the world outside, he is but a memory . . . and then a timeless legend. But Robin lives on, undead and buried, and awakens in a strange land, where Vlad the Impaler, Dracula, is the prince. Robin soon discovers he has a very eerie affinity with Vlad. I will not say more about this unusual story, except that it is Robin Hood as you have never met him before. If you have a fancy for Robin Hood of the Otherworld, this is definitely for you. Now I like a good spooky story, especially when Hallowe’en is in the air. So, hoping for some hairs to stand on end, I took my Kindle with me on a recent break at 14th-century Dartington Hall in Devon. Come dusk, I went alone into the empty great hall, where every step echoes, and the sounds of the rest of the building are muffled. Then I became immersed in this shiversome story of vampires and the true eternity of Robin Hood. Hmm, all very well and good to give myself the heebie-jeebies, but afterwards I had to get from the great hall, along the screens passage and out beneath the porch to . . . .the wide, dark courtyard, where the lights of the lodgings on either side shone through the night. Suddenly it was a l-o-n-g way to the East Wing, my husband and the safety of our room. It is with some honesty that I say my feet fair flew! Just make sure the doors and windows are locked when you read it . . .
PS – I also came out of that great hall with a ghost story of my own to write. Thank you Dartington, and above all, thank you J P Reedman! Who takes the ultimate responsibility for events in late Medieval England? According to the Cairo-dwellers, from 1483 to August 1485, the answer is the King (Richard III), whether he knew what happened or not. According to the same people, the answer from 1471 to 1483 isn’t the King (Edward IV) but the Duke of Gloucester (the same Richard), his brother who was ten years younger.Not so many of them still blame Richard for committing war crimes at the first Battle of St. Alban’s (1455, between nappy changes) but some do. They expect us to believe that, when Edward declared the Countess of Warwick legally dead to keep the Duke of Clarence happy, that was Richard’s responsibility. Similarly, when Edward declared the Dowager Countess of Oxford legally dead to stop her funding her traitor son, that was Richard’s responsibility as well. That Richard, as Constable, passed and oversaw the sentences of death after Tewkesbury against Edward’s will – even though we know what Edward could do to a brother who stepped out of line continually and we know that this was Richard’s first serious campaign. That Richard was responsible for Clarence’s end, although he is on the record as protesting against it and going on strike for the day of the execution. That Richard had to be responsible for Henry VI’s end even though it was improbable that he could benefit from it – Edward had a very fertile “wife” at the time and the secret wasn’t known for another twelve years, quite apart from Clarence – and he was away from the Tower on the day. That Richard had to be responsible for Edward of Lancaster’s death, even though Clarence is specifically accused by contemporaries and instantly became the Lancastrian claimant, at least in his own eyes. So Edward IV was King for over twenty years and so feeble that he wasn’t responsible for anything? On the contrary, we know how ruthlessly he had dealt with rebels during his first reign, appointing the Earl of Worcester (John Tiptoft) as Constable, knowing the zeal with which he would approach the task, only for the Lancastrian readeption to result in Tiptoft’s beheading. We know how he dealt with the Duchess of Norfolk’s servants to silence her after the death of her sister (his valid wife). We know how he dealt with the Earl of Desmond’s sons and we know he eventually dealt with Clarence, arresting Stillington at about the same time. We can conclude that Edward IV was no fool. He could look after himself, could delegate tasks to people who would take his approach and could take responsibility for their actions in his lifetime. He did not reprimand Richard for his conduct as Constable nor did he deal with him as he had Clarence but designated him as Lord Protector of the Realm in his codicil, as the Council all agreed, also allowing him to remain as Constable. We can only conclude that he trusted Richard on the basis of twelve years’ loyal support and more before the Clarence-Warwick revolt. So what is the problem with the denialists here? William Catesby, a Northamptonshire lawyer, was one of only three people executed in the aftermath of Bosworth, the others being a West Country father and son. From this and other circumstantial evidence, we are inexorably drawn to the conclusion that this happened because he was the only surviving layman who knew the details of Edward IV’s bigamy. In this respect at least, by not executing members of the clergy, Henry VII conducted himself as had his Yorkist and Plantagenet predecessors but not as his descendents were to act. A hundred and twenty years later, his descendant Robert (Robin) Catesby was one of the ringleaders of the “Gunpowder Plot” and was shot dead, resisting arrest, at Holbeche House in Staffordshire, just three days after the Plot had been discovered. An ardent Catholic recusant, he had already survived participating in the Essex Rebellion of 1601. As you can see here (Catesbys2), the family’s ancestors can be traced back to another William, who died in 1383. From 1375 until 1605, with a short interruption, they lived at the Manor House, Ashby St. Ledgers. To what extent were the actions of the younger Catesby influenced by his ancestor’s fate? All Souls’ Day is Sunday, November 2nd. Beginning in 998, it was the day the ancient church set aside to pray for the dead — not just for your relatives, but for anyone you loved. In medieval England, children and the poor went “a-souling” on All Souls Day; going door to door, they begged for soul cakes, each one marked with a cross. If you received one, you were supposed to pray for the dead, to help shorten his or her time in Purgatory. Bells were rung and candles were lit to comfort dead souls languishing in darkness. The tradition is still alive today as the Catholic church celebrates All Souls’ Day (Commemoration of the Faithful Departed). Candles are lit, special masses are said, and prayers are offered for the souls of the faithful departed, to assist them on their journey from Purgatory to Heaven. Whether or not you’re Catholic, you can visit any local parish church this week and add the names of those you love who have passed on to the parish’s list of souls, and they will be prayed for on All Souls’ Day. If you’re a more private person, you might light a candle and offer a prayer in private. 1) The Mortimer-York army in 1458-60 was led by the Duke of York, two sons, a brother-in-law and a nephew. Charles I’s principal commanders were himself, two sons and two nephews. 2) Richard of York had four healthy sons, one named after himself who became King. Charles I had three healthy sons, one of whom bore his own name and eventually succeeded him. 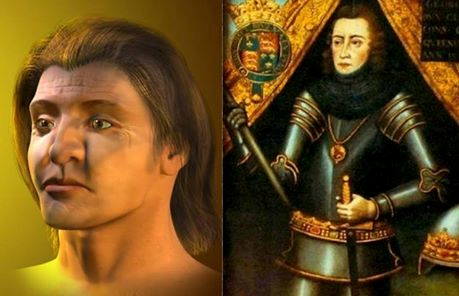 3) Richard III was crowned because his nephews (and nieces) were illegitimate, as was James VII/II. 4) Henry of Buckingham’s revolt was apparently coordinated with that of his cousin, Henry “Tudor”, as was James of Monmouth’s with the Earl of Argyll. 5) “Tudor” sought to land in Dorset, which Monmouth actually did. 6) Autumn 1483 and summer 1685 were both exceptionally wet, hindering the revolts. 7) Buckingham and Monmouth both went into hiding but were eventually captured. Who painted that portrait? And when…? For anyone interested in portraits of those who lived centuries ago, it can be very frustrating—if not to say aggravating—to come across one portrait, that recurs all over the internet and identifies the people in it, but that is all. No date, no artist, nothing. 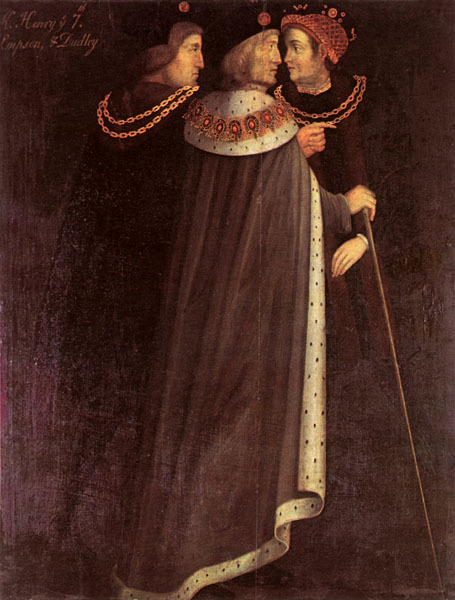 A good example is this portrait of Henry VII with his two henchmen Edmund Dudley and Richard Empson. Henry VII is in the middle, of course, with Empson on the left and Dudley on the right, in the fancy hat. If you search Google Images for Dudley and Empson together, this picture comes up time and time again. It looks as if it was painted from life, or at least by someone who had seen all three men. But was it? 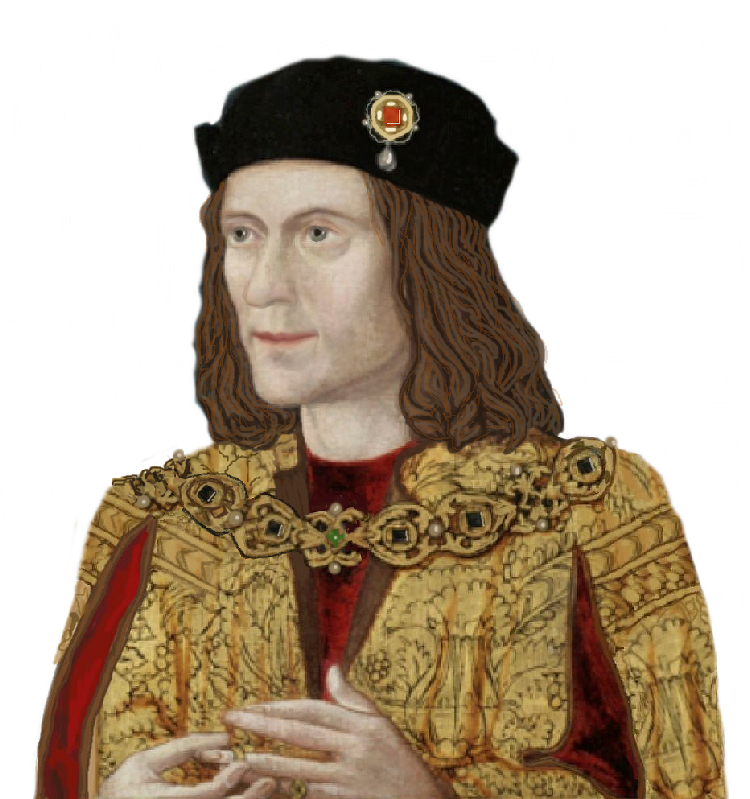 As with the portraits of Richard III, no one knows exactly when they were painted. Copies from an original? Guessed at in the sixteenth century and clothes accordingly? A definitive answer is not forthcoming. Did Dudley and Empson look like this? Was Dudley a natty dresser? All we can say is that the likeness of Henry is executed with some accuracy. Certainly you could pick him out in a crowded room, whether or not he wore ermine. He is quite distinctive, tall, slender and rather elegant. Maybe not the world’s most handsome, but still identifiable. Sooo, what is the provenance of this work? When someone me asked who painted it, I was stumped. None of the internet images actually told me anything, other than who was in the picture. So I started to look, prying all over everywhere in an attempt to run this mystery to ground. Surely this has to be right? Mr Eller certainly seems to know what he is talking about, and if he thinks it is the work of Sigismund Holbein, who lived and died in Wells during Henry’s reign, then I feel certain this painting is indeed Uncle Holbein’s work. If anyone knows better, please let me know, but unless or until someone can prove otherwise, I am content that I have run this picture to ground. It was painted during Henry’s lifetime, and therefore during the lifetimes of Dudley and Empson as well, and so stands a very good chance indeed of being a true likeness of all three. And I think one of the three was a dedicated follower of fashion. Take a bow, Edmund Dudley. Postscript: Since writing the above, I have learned from a guidebook to Arundel Castle that the man in grey is identified as Thomas Howard, 2nd Duke of Norfolk. If correct, it means he is the son of “Jockey of Norfolk”, who died at Richard’s side. The 2nd Duke was the Earl of Surrey who also fought for Richard, but was captured and imprisoned by Henry VII. Wikipedia also identifies the portrait as being the 2nd Duke. So, when he was released after three years in Tower, did he cosy up to Empson and Dudley? I suppose he must have done, because he certainly cosied up to Henry! Boo! Hiss! This time it is Tutankhamun (no doorbell jokes, thankyou) nearly three millennia earlier. The “virtual autopsy” shows him to have had a clubfoot and he owned about a hundred walking sticks as a consequence, strangely held in the wrong hand. DNA evidence appears to show his parents (Akhenaten and the “Younger Lady) to be siblings, which is almost enough to make a pontiff spontaneously combust. Such such inbreeding, in which he later participated, is likely to have led to his fatal illness as well as his lameness, although he was previously thought to have died in a chariot accident. His identity was confirmed by his recorded location. There was a campaign of “damnatio memoriae” against him, which may sound familiar. What has Richard III started? Thankyou to those who read our post “The explorer and the Clarence descendent”. We now know that, just like Richard III himself, there is a facial reconstruction of Bartholomew Gosnold.